It’s getting down to the wire. If you haven’t figured out your holiday gifts yet, it’s probably time to get a move on. UC Press has some beautiful books that would make great presents for your dear ones. Looking for a New York Times Best Seller? Pick up a copy of the Autobiography of Mark Twain. Want to impress the oenophile in your life? Take a look at Terry Theise’s Reading Between the Wines, which the Washington Post says “should be required reading for wine aficionados and also for newcomers who might not yet have put voice to their appetites for new and interesting wines.” Robert Duncan’s The H.D. Book is a long awaited exploration of modern poetry and poetics by one of America’s most acclaimed and influential postwar poets. 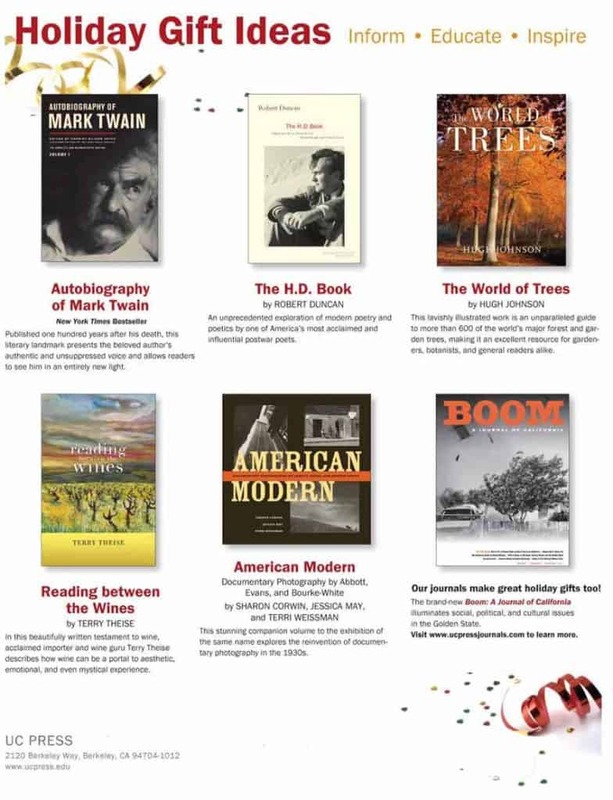 And Hugh Johnson’s The World of Trees has been named one of the best gift books of 2010 in the New York Times, Globe and Mail, and elsewhere. Click the image below to view a full sized version our holiday gift guide.